The dandelion is a hearty member of the sunflower family of plants, the composites. The composites make up a very large family of flowering plants, and they are considered as major bee plants. Many of our favorite garden flowers are composites: asters, sunflowers, daisies, bachelor’s buttons, coreopsis, coneflowers, and black-eyed Susans. Everyone is familiar with the dandelion with its bright yellow flower, broad leaves indented in the shape of lions’ teeth, and seed heads that children love to blow into the wind. The flowers are often the first to bee seen in January as well as the last to be seen in December. Some people make salad greens of dandelion leaves. The plant is used to make wine. Many simply appreciate the beauty of the bright yellow flowers. Perhaps, though, the greatest use of the dandelion is for forage for the honey bee and the native pollinators. Producing both nectar and pollen, it is at times the only flowering plant available for the bees. For them, it may be a life saver. In some neighborhoods the dandelion is considered a weed in the lawn to be sprayed regularly with herbicides. 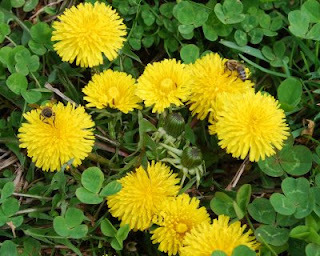 It would be beneficial to the pollinators if more people would leave a portion of the lawn, maybe the backyard, with dandelions. I consider those bright yellow flowers a part of a healthy environment. An overnight rain filled the exposed flower pots with water. 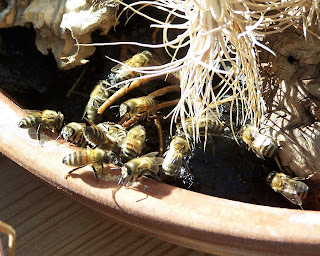 The next day this flooded planter was visited by great numbers of honey bees. At this time of the year, many people find honey bees in locations that they don’t expect to find them. These bees appeared to be collecting water. Honey bees bring a large amount of water into the hive. In the summer, water is used to cool the hive. In the early spring the bees are using water to dilute stored honey. The colonies are expanding rapidly and are consuming large amounts of food. At this time there is not a great abundance of nectar available for the bees to forage. To make up for the shortage of nectar, the bees consume honey stores left over from the winter. To consume the honey, made up of concentrated sugars, the bees bring in water to dilute the honey. The adult bees derive energy from the honey. They mix the honey with pollen to make “bee bread” to feed to the developing brood. Other honey bees may be found in bird feeders, collecting dust from the millet seeds. The dust has the texture and appearance of pollen. It is one of several similar substances brought back to the bee hive by pollen-foraging bees. They are unaware that the dust has far less nutritional value than the pollen they seek. If there is a diversity of plants available, the bees bring in pollen from many different ones. This helps ensure good nutrition for the bees. Often we’re surprised at the places we find honey bees. After a swarm of bees has landed on an object in the vicinity of their hive, they send out scout bees searching for a suitable new home. The natural home of the honey bee is the cavity of a hollow tree. A bee hive is a hollow wooden box which simulates a hollow log. To the great displeasure of many, the hollow walls of a house or building are sometimes chosen by the scout bees to be the perfect cavity for the new brood nest. Here, you see me in the process of catching a swarm of bees before they have the opportunity to move into a nearby house. Once the swarm of bees has located a suitable cavity, it will fly in a mass movement to its new home. As soon as the bees enter the cavity, they immediately begin building a nest of beeswax. The queen will start laying eggs as soon as some cells are built in the brood nest. This will mark the beginning of a new honey bee colony. Swarming is the way that honey bees propagate on a colony-wide basis. In the swarming process, the bees create a new queen to remain in the nest while the old queen flies away along with a large number of bees, often half of the colony. Upon leaving their nest, the bees fly around in a swirling extended mass. I try to choose a word to describe this mass of bees, and I think the best one is “swarm.” After flying for a few minutes, the swarm will gather together into a tight cluster hanging from a tree limb or attached to a structure like a mail box or a building. 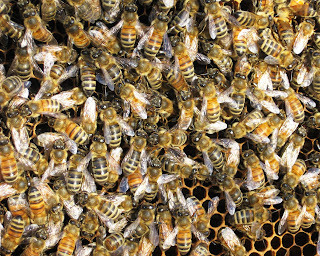 The swarm of bees is organized into a tight cluster by pheromones, or scents, given off by the queen and certain worker bees. The cluster of bees will remain on its resting place, the tree limb or structure, for a few hours or even for a few days. While it is there, scout bees leave the cluster searching for an appropriate cavity to serve as a permanent home for the colony. 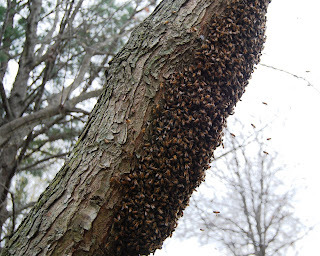 Here, the swarm has gathered on a large limb of a maple tree. Honey bees expand their range and increase the number of colonies by dividing their colony in two. This process of propagating bees on a colony-wide basis is called swarming. Typically, honey bees swarm once a year. This usually occurs in the spring, however some swarming continues through the summer and fall. The process of swarming begins with the growth of the colony early in the spring. Often the bees will outgrow the size of the cavity the colony is occupying. The bees will begin swarm preparations by creating a new queen, as every colony must have a queen. Once there is a new queen in the colony, or one is nearing the point of emerging as an adult, the colony will divide itself. Usually half of the bees or more will fly away, accompanied by the old queen. In a swirling cloud of thousands of bees, the swarm drifts around until it gathers on a nearby resting place where it stays until it moves along to a cavity for a permanent nest. 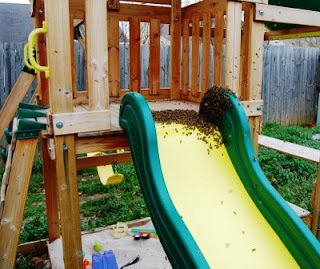 Here, a swarm of bees found children’s playground equipment as a convenient resting area. In many such cases, swarms become interesting but unwanted visitors. Along rural ditch banks and field margins as well as in suburban lawns an impressive pinkish red tree is now in bloom. 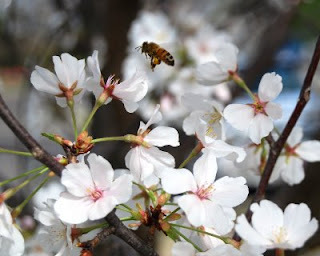 Upon close inspection we see honey bees in great numbers amid the colorful blossoms along the twigs and branches. This is the redbud, a member of the legume or pea family. The legumes are an important family of bee plants which includes wild and cultivated peas and beans, vetches, clovers, alfalfa, lespedeza, wisteria, locusts, soybeans, and peanuts. 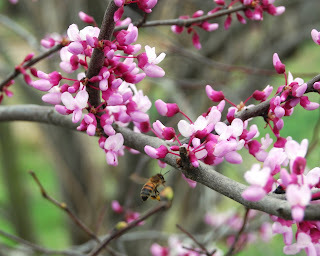 The honey bees gather both pollen and nectar from the redbud at a time when large amounts of food are being consumed to feed the colony’s rapidly expanding brood nest. These bright red trees are a welcomed sight to both the bees and the beekeeper. The natural home of the honey bee is a hollow tree. A tree which has been damaged by lightning, or woodpeckers, or termites will often have a cavity in which a colony of honey bees can thrive. The bees are not at all particular with the appearance of the cavity they choose for their nest. It may be a tree, a wooden bee hive, or the space inside the walls of your house. Wooden porch columns are similar to hollow trees, and make extremely attractive nest sites for honey bee colonies. The bees only need a tiny opening to serve as an entrance. Actually, many homeowners live with honey bees and never know it if the point where the bees enter the home is up high or out of view. In the United States, all managed honey bee colonies are housed in bee hives of the design developed by Philadelphia minister L. L. Langstroth in 1851. 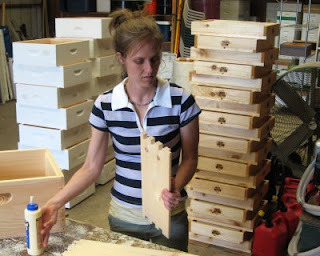 Beekeepers, like Dallas, assemble bee hives to add to the bee yard as the bees multiply rapidly in the spring. The beekeepers build the wooden bee hives, equipped with frames. The bees finish their nest by building beeswax comb on the frames. The comb holds the brood—the developing honey bees—and the honey. Cherries in bloom are a sure sign that spring has arrived. When the cherry trees along Cherry Road leading into the Memphis Botanic Garden are in full bloom, it looks like there has been a heavy late-season snow. Cherry Road is one of the most beautiful vistas in Memphis, a city of trees. People are attracted to the cherries for their color, pattern, and fragrance. The same attractions call to our bees which pollinate the garden. The Memphis Botanic Garden is the home of one of the bee yards of Peace Bee Farm. Our honey bees provide pollination for the flowering plants and serve to illustrate to the public the importance of bees to the plants and the environment. The cherry is a member of the rose family, an important family of bee plants. Most of the roses provide both pollen and nectar to the bees. Some of the other roses are the plum, pear, apple, almond, blackberry, and the hawthorns. As we examine a bee hive at this time of year we are looking for a rapidly growing colony. If all is well, we have a queen laying a large number of eggs in a tight pattern in the center of the hive. As the developing brood makes the change, a metamorphosis, from egg to larva to pupa to adult, it is cared for by young workers called nurse bees. These bees produce the food, “bee bread,” and feed it to the rapidly growing larvae. They also regulate the temperature of the brood, maintaining the brood nest at 95 degrees Fahrenheit. As we see on this frame from the brood nest, the brood is almost always covered by the tightly clustered bodies of the nurse bees. This colony is growing nicely. It is on schedule to produce a large population of bees to take advantage of the abundance of flowers in the spring and summer. The Memphis Area Beekeepers Association conducted its forty-fourth annual Short Course in Beekeeping today. Such short courses are conducted by experienced beekeepers in the spring to introduce interested newcomers to the art and science of beekeeping. 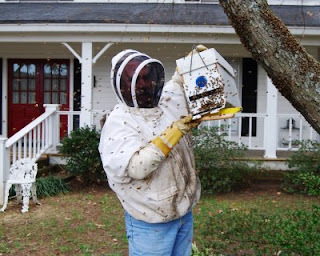 The MABA is a group of beekeepers from Tennessee, Mississippi, and Arkansas that meets in Memphis, Tennessee regularly for beekeeping training. Rita and I have both served as officers of this group, with me having served for two years as president. With recent news stories detailing the loss of honey bee colonies and the decline of many pollinators, there is currently great interest in honey bees and beekeeping. Shown here after the day’s training program are three faces familiar to the bees of Peace Bee Farm. 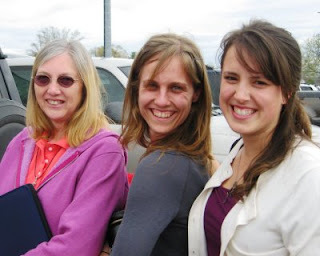 From the left are Rita Underhill, co-owner of Peace Bee Farm, Dallas Holland, and Mary Phillips. No wonder that the Peace Bees stay so happy! With the changing of seasons from winter to spring, the honey bees take advantage of any warm day to forage for pollen and nectar. The pollen is of particularly great importance for feeding the developing brood. The best nutrition is derived from a mixture of pollens from various sources. Here, we see the foraging honey bees entering the hive with their pollen baskets loaded with pollen from multiple sources. Some readers of my posting of Wednesday, March 18, 2009 questioned what they were seeing in the photo of the frame of bees with cells filled with pollen. Let me reprint Wednesday’s picture from inside the hive. Here is an explanation of some of the objects we see: In the center we see one foraging bee with pellets of pollen on the pollen baskets of her hind legs. Across the lower portion of the frame we see cells packed with yellow, orange, and red pollen. The black, shiny cells are filled with honey. 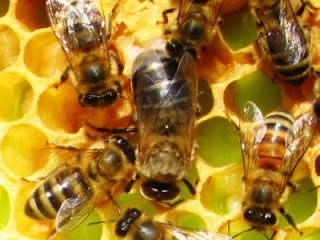 The tan-colored cells with a “damp” appearance are filled with “bee bread,” made of pollen mixed with honey. Finally, the loose yellow flakes are recently collected pieces of pollen that have not yet been packed by the bees into the cells. Click on the image for a larger view. As we approach the beginning of spring, the honey bees are rapidly expanding their colonies. While the bees huddled together in a small cluster over the winter with very little egg laying, they are now expanding their colony. The strong queen is now laying fifteen hundred or more eggs per day. When we open the hive the bees not only cover the frames, but they also spill over onto the tops of the frames. The majority of the bees that we see here are workers, but drones are starting to be seen in the hive as well. One large, dark-colored drone can be seen just to the left of the center of the picture. The honey bees’ natural tendency is to expand the colony’s population at this time and then split the colony into two. This colony-wide propagation is called swarming. It is the way that the bees seek out new nesting areas and expand their range. With the approach of spring, the large bee population is a welcomed sight for the beekeeper. It takes a large population of bees to take advantage of the spring flowers soon to burst into bloom. On this warm late-winter day the bees bring in pollen in large volumes. On the landing board at the entrance of the hive we see large numbers of foraging bees returning with their pollen baskets loaded with bright yellow pellets of pollen. A few others carry bright red or tan colored pellets. The pollen baskets are on the bees’ hind legs; in the sunlight, the bright pollen makes the bees look like cars with their tail lights shining. Inside the hive, the bees pack the pollen into cells using their heads as rams. Other bees mix in some honey with the pollen to make “bee bread” to be fed to the developing honey bee brood. The bees’ honey is pure carbohydrate. With the pollen, the bees are adding protein, fats, vitamins, and minerals to make a complete food for the developing brood. The hive is having a population explosion at this time of the year in anticipation of the flowers to come in the spring and summer. It takes a lot of pollen to feed the rapidly growing colony. As spring nears, the bees are continuing their preparations for the change of seasons. While inspecting hives this week, we find drone honey bees moving about the combs. The drones are the only male honey bees. Having a boxy appearance, they are larger than the workers. Their eyes, which seem to meet in the center, are considerably larger than those of the workers. The drones have no sting. While a honey bee colony will annually produce many thousands of workers, it will only produce several hundred drones. The way we understand drones, their sole purpose in the honey bee colony is to mate with queen bees in flight. The drones thus accomplish a necessary role in reproduction of bees within the hive as well as propagation of colonies through swarming. Drones are found in the hive from spring through fall. Typically, they leave the hive each afternoon seeking a queen in an area of the sky known as a drone concentration area. 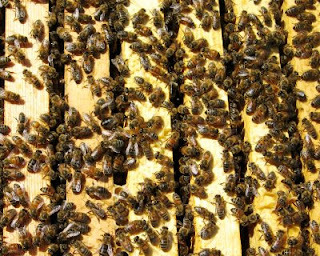 With the presence of drones in the hives, it won’t be too long before beekeepers set up queen-mating nucleus hives to accommodate new queen bees. The presence of drones in the hive is a true sign of spring approaching. 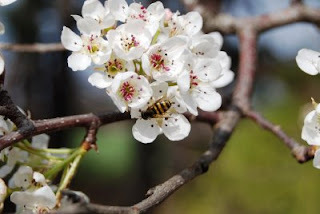 A visit to the first crab apple to come into bloom found both honey bees and native pollinators in great numbers. No, that bright black and yellow striped insect is not a honey bee. Honey bees have a hairy body, not a slick, shiny body like this insect. This is a solitary bee, one of many species of native pollinators. We are learning of the importance of our pollinators, as we are finding that the honey bee and many of the native pollinators are declining in numbers. The pollinators, including birds, bats, and insects, are necessary for the production of one third of the food we humans eat. We consider the honey bee to be the most important of the pollinators, as it accomplishes the vast majority of our agricultural pollination needs. The pollinators are in decline due to urbanization and agricultural practices causing a loss of habitat, the decrease in the number of native plants, and the increased use of pesticides, herbicides, and chemicals. Is there anything that we can do to help reverse the loss of pollinators? A simple step that many of us can take is to plant a pollinator garden. This is merely a plot of your favorite plants that you choose from a list of bee-friendly plants. It may take the form of a flower bed in your lawn, a landscape planting, or a kitchen culinary herb garden. To protect the pollinators, we must prudently restrict the use of pesticides and chemicals. The National Academies of Science web site may help you plan your pollinator garden. It is located at http://dels.nas.edu/pollinators/plantsforpollinators.shtml. Beekeepers are trying to provide for a healthy population of both honey bees and native pollinators. What are all those tiny purple flowers in our lawns? 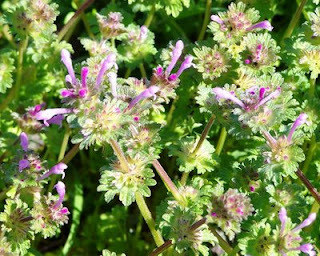 They are Henbit, a prolific early-spring wildflower in lawns, gardens, orchards, and agricultural fields. The flowers are on low plants with crinkled, round leaves. The Henbit, along with its cousin, the Purple Deadnettle, is a member of the mint family. The mints, one of the important families of bee plants, are easily identified; they all have square stems. Beekeepers and those interested in protecting the wild pollinators welcome Henbit in their lawns. They don’t spray herbicides on their lawns for this broadleaf wildflower. It’s important bee forage. Pear trees burst into bloom. In late winter, the pear trees are covered with bright blossoms. 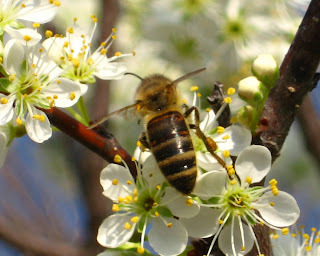 The honey bees are attracted to the fruit trees for pollen and nectar. As we zoom in for a close look, we see that many of the honey bees have a shiny abdomen. These bees have lost much of the fine hair covering their bodies. 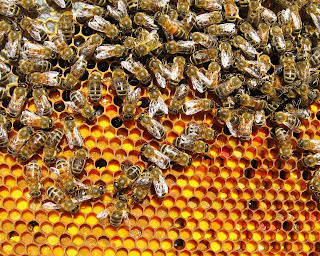 Aging bees, like aging beekeepers, start to lose their hair. These are bees that were born last September and October. Fall bees have a slightly different physiology from summer bees. Fall bees are equipped to live up to six months while their summertime sisters live but six weeks. 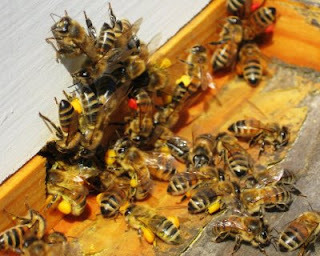 These fall bees survived the winter in a warm cluster of bees inside the hive. Now their task is to bring in food to rear a large population of bees to take advantage of spring’s flower bounty. Honey bees start increasing the population of the colony early in the year. In the late winter and early spring the honey bee takes advantage of every warm day to search for sources of pollen. The pollen is needed to provide protein for the developing bee brood. Here, we see a honey bee with her pollen baskets full of bright yellow pollen collected from the blossoms of a Forsythia bush. 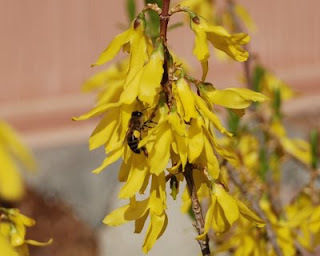 Forsythia, an old-time favorite of gardeners, is one of the first bright yellow-flowering shrubs to be found in bloom in the late winter. At this time of the year, with warm days interrupted by periods of cold, in which the bees cannot fly, pollen supplies are precious commodities. There is a close connection between the honey bees and the flowering plants that they visit. The bees are attracted to the flowers by their color, shape, floral pattern, and aroma. From the flowers, bees derive their food in the form of nectar and pollen. While visiting the flowers, the bees inadvertently carry pollen from one part of the flower to another accomplishing cross-pollination, a necessary step in the plant’s reproduction. There is also a close connection between beekeepers and the plants that feed their bees. Beekeepers are always on the look-out for the particular flowers that are attracting the bees on any given day. In the late days of winter, the first white-blooming tree to be seen in the Mid-South is the plum. The blossoms shine through the bare forest margins as we drive through the country. Plum thickets often remain as reminders of long-abandoned home sites. 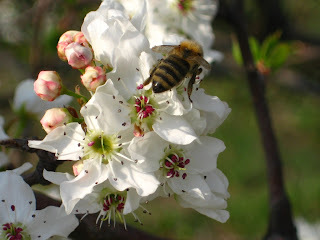 On a warm late winter day, plum trees will attract large numbers of honey bees.